India’s Prime Minister Narendra Modi will visit Korea from Thursday to Friday to meet with President Moon Jae-in in an effort to strengthen relations between the two countries. Modi’s state visit takes place less than a year after President Moon Jae-in held a bilateral summit with the prime minister in India in July last year. Korean first lady Kim Jung-sook had participated in the Deepotsav event in India’s city of Ayodhya in November last year. 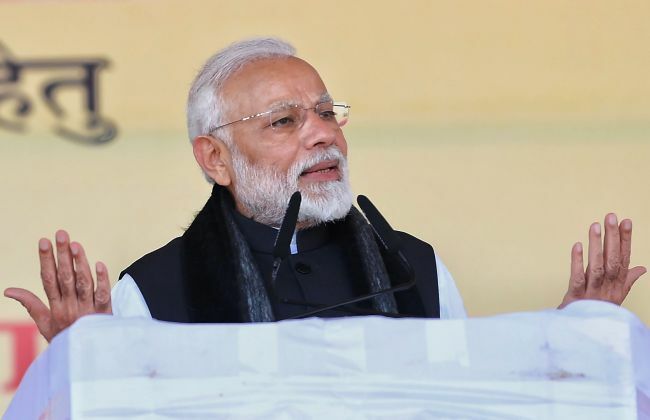 Indian Prime Minister Narendra Modi speaking during the inauguration and foundation stone laying ceremony of various development projects in Jhansi, in the Indian state of Uttar Pradesh, Feb. 15. “The visit is part of the new momentum in high-level exchanges between India and South Korea. It will demonstrate that India’s New East Policy is focusing on expanding relations with South Korea in a multi-dimensional way,” the Embassy of India said in a statement. Confirming the visit, Korea’s presidential office said the two countries’ strategic partnership would be bolstered across sectors including infrastructure, space and defense. “The two leaders will discuss detailed measures to develop relations that are more mutually beneficial and future-oriented,” it said. On Friday, the Indian prime minister will receive the Seoul Peace Prize from the Seoul Peace Prize Cultural Foundation in recognition of his national and international contributions.